As a man, if you have been married for a while, or "going steady" and/or been living with your girlfriend, you will notice a psychological difference in how women's minds, bodies and dreams work. As a young man, I searched for understanding of these psychological differences, becoming interested in both men's and women's studies. Reading a variety of "women's studies" literature led me to two books that can provide an explanation of the dream from Martin (below). The two books are "The Wise Wound: Myths, Realities and Meanings of Menstruation", by Penelope Shuttle and Peter Redgrove, and Patricia Garfield's "Women's Bodies, Women's Dreams" which shed light onto some of the dreaming differences. Patricia Garfield "Women's Bodies, Women's Dreams" states; "Women who are sensitive to their dream imagery learn to recognize where they are in their menstrual cycle from the pictures in their dreams." A woman's menstrual cycle is not only found represented in women's dreams it is also found in men's as well. Tornados are "natural" phenomena, the geometric shape of a tornado is "feminine" in nature. My experience with women's dreams is that tornados often are a symbolic representation of the symptoms of Premenstrual Syndrome a.k.a. PMS. 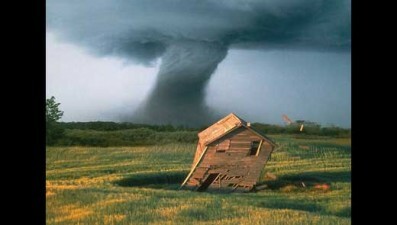 The fact that the tornado is usually approaching your home seems to indicate that you may feel your wife has PMS. The tornado would be a visual metaphor for what goes on in your wife's body, not to mention the how PMS affects her mind. The most commonly-reported psychophysical symptoms include: mood swings, headaches, swelling of ankles, feet, and hands, backache, abdominal cramps or heaviness, abdominal pain, abdominal fullness, feeling gaseous, muscle spasms, breast tenderness, weight gain, recurrent cold sores, acne flare-ups, nausea, bloating, constipation or diarrhea, decreased coordination, food cravings etc. Women (and men) who are searching to understand the psychology of the menstruation will find answers in the "The Wise Wound". The book came into being when Penelope Shuttle began to suffer from "bad menstrual depressions". Shuttle; "dreamed every night for five months, and the dreams were analyzed every day, in sessions lasting many hours." Understanding the dreams led to self understanding, acceptance and relief from the depression. One might speculate that in understanding feminine "nature", Shuttle learned to better understand the collective archetype of the "wise old woman". Below are two more "tornados" found in dreams, the first from a young woman living in New York City and the other from a young man, who seems surrounded by tornados. I often have tornado dreams even though I live in New York and I've never witnessed an actual tornado where I live-- only two storms passing through with the capability of producing a funnel cloud (with the funnel cloud spotted touching down in a place farther from where I am). I'm going down a path out in the country and always looking at the sky to the right of me and suddenly a massive tornado will appear. I don't turn around and run the other way, instead, I keep running to my destination as I was before. Then, another tornado will appear, and another, and another. There's always 4 tornado's before I decide to try and run away and they always chase me but only get about 10ft. to me and stay there. They never pass me or engulf me. Walter B Cannon "The Wisdom of the Body"